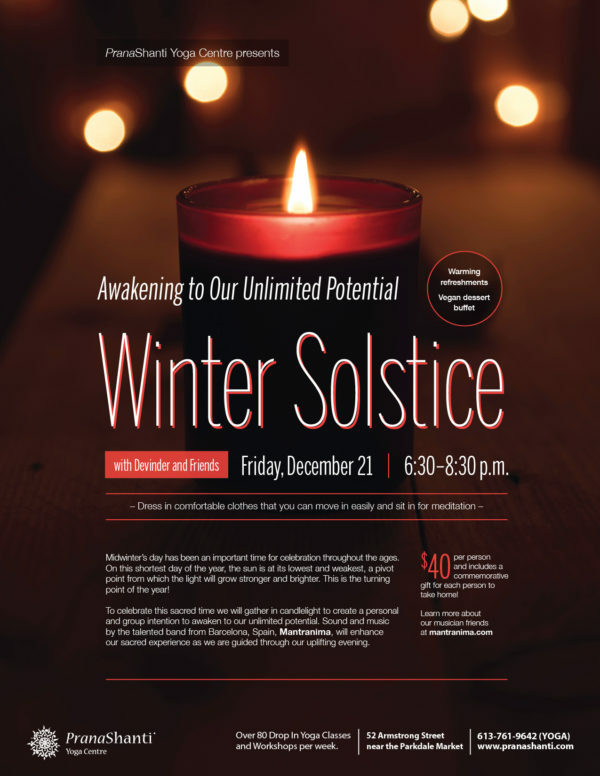 Our Annual Winter Solstice Celebration is December 21! Midwinter’s day has been an important time for celebration throughout the ages. On this shortest day of the year, the sun is at its lowest and weakest, a pivot point from which the light will grow stronger and brighter. This is the turning point of the year! To celebrate this sacred time we will gather in candlelight to create a personal and group intention to awaken to our unlimited potential. Sound and music by the talented band from Barcelona, Spain, Mantranima, will enhance our sacred experience as we are guided through our uplifting evening. Warming refreshments and a vegan dessert buffet will be served. Cost: $40.00 per person and includes a commemorative gift for each person to take home! Dress in comfortable clothes that you can move in easily and sit in for meditation.